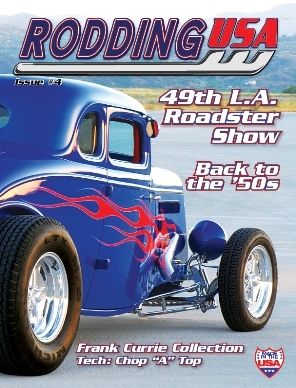 Rodding USA magazine's Issue #4 is available to order now. Magazines ship same or next day. Our fourth edition of Rodding USA magazine features two masterpiece features. First up is Steve Ernst's cool deuce highboy built in a late fifties style while the second reveals the full story behind editor Paul Martinez's own '34 5-window coupe which he's owned since the seventies. Those are backed by an additional four hot rod features plus six special interest features which includes an excellent story on two real hot rod girls, Sarah and Hannah Hoffman from Austin, TX who are building their own cars under grandpa's guidance. We also go behind the garage doors at industry icon Frank Currie's home and talk to him about his collection of amazing hot rods and his exploits in the past. We check in on progress of Dave Blatt's deuce tudor build and also tour Currie Enterprises new facility and Vintage Air's manufacturing plant. Our event coverage criss-crosses America with an extensive 13-page feature on the 49h LA Roadster Show in Pomona, CA held just a few weeks ago plus coverage of the Back to the Fifties event in Minnesota and the Nats South in Knoxville TN. If you're into doing it yourself then check out our Tech feature on chopping a Model A plus our regular features, new products, news from around the industry, hot rod artists and the latest list of hot rod shops stocking the magazine. It's an excellent read, just click the Add to Cart button above to buy your copy. Rodding USA…by hot rodders, for hot rodders.